The undergraduate program offers three degree options which can lead to a degree of Bachelor of Science in Chemistry, Bachelor of Science in Biochemistry or a Bachelor of Science in Chemistry with a concentration in Forensic Chemistry. While courses have been designed to meet the accreditation standards of the American Chemical Society (ACS), they also allow students to develop a strong background in science. The Department of Chemistry has an active undergraduate research program. Students work with Chemistry faculty to develop both skills and interest in chemical research.The undergraduate research program is structured to expose students as early as the freshman year to elements of chemical research. The Graduate Program in chemistry is a thesis-based study leading to the degree of Master of Science. 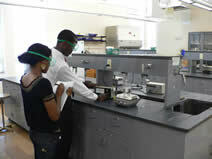 To be considered for admission to the program, the student must hold a bachelor of science/arts degree in chemistry. The Department of Chemistry has two seminar programs--the Departmental Seminar Program and the Senior/Graduate Seminar Program. Each seminar program is directed by a Chemistry faculty member and announcements for upcoming seminars are posted throughout Turner Hall.